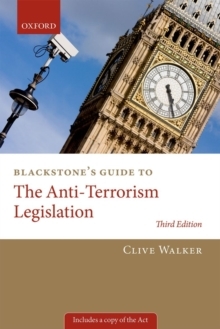 Published soon after enactment, they offer expert commentary by leading names on the extent, scope, and effects of the legislation, plus a full copy of the Act itself. 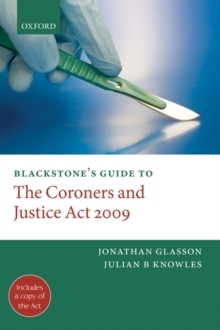 The Coroners and Justice Act introduces significant changes to the inquest system, including creating a new national coroner service and establishing a new system of secondary certification of deaths that are not referred to a coroner. 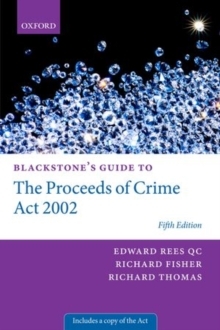 It also reforms and clarifies the law on homicide; updates the language of the offence of assisting suicide; and contains amendments to the Data Protection Act 1998 to strengthen the Information Commissioner's powers and improve the sharing of information. Itwill establish a new Sentencing Council for England and Wales, and introduce changes to sentencing for terrorist offences. It will also introduce changes in the arena of witness anonymity, including: granting Investigative Witness Anonymity Orders in gun and knife crime cases; granting anonymity tovulnerable or intimidated witnesses; and extending the use of live video links and screens around the witness box to enable vulnerable witnesses to give evidence. 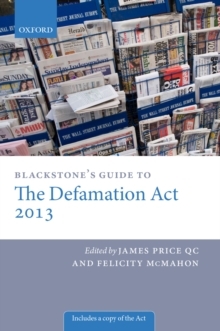 This new Blackstone's Guide combines the full text of the Act with an expert narrative. It seeks to explain the scope and impact of the Act, including the civil liberties implications, and to bring practitioners up-to-date with this complex piece of drafting. Presented in a straightforward layout, it enables ease of use as a reference source.